I was expecting madness on the TV Comedy side this morning when The Golden Globe nominations were announced. I ranted about it yesterday in my post about the SAG nominations. So while I am not happy about the insanity that is the TV Comedy section of the Globe Nominations, as LEAST I was prepared. I was NOT prepared for the madness of the drama nominations. Let’s get right to it, shall we? THEY SNUBBED MAD MEN. The show that THEY were the first real champion of. The show that has won this award THREE TIMES. Also, I still don’t get the obsession with Boardwalk Empire. It bored me to tears in the first few episodes of Season One, so I gave up on it. I can see why it’s an awards magnet: it’s a lavishly designed period piece (see also: Downton Abbey, except Downton is freaking flawless and emotionally engaging). I just never really connected with Boardwalk, so I gave up. Should I try again in ALL of my free time, dear readers? Let me know. All of this being said, I still think this award is Homeland‘s to lose. Everything is Jean Ralphio and nothing hurts. As I predicted in my “Halloween Surprise” recap, Tom’s decision to let Jean Ralphio in on Rent-A-Swag (high-end clothing rentals for middle schoolers) ended up being a lot more fun for us than it was for him. Unlike Tom, Jean Ralphio learned absolutely nothing from the dramatic rise and fall of Entertainment 720. After the business partners’ first presentation plan is shot down by April, Tom takes her abrupt advice and embarks on a redesign. This idea has a good chance of working, and he’s not going to squander the opportunity. April has been Ron’s gatekeeper for long enough to know what he wants – no lights, no making it rain, no stupid, made-up words he won’t understand. While Tom tries to focus in on a tighter, more professional approach, Jean Ralphio buzzes around him – an overgrown, be-scarfed, hyperactive child. To Tom’s credit, his reluctance to cut JR loose stems from his ideals of loyalty and friendship. They’re partners. But since Jean Ralphio flat out tells Tom that he couldn’t be less invested in the project, Tom can move forward solo and guilt-free. 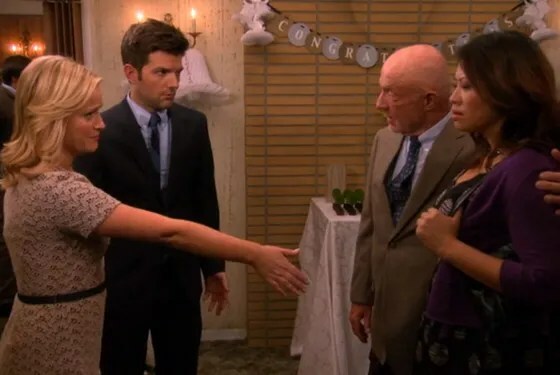 Ron couldn’t have been less psyched to see Jean Ralphio at Ben and Leslie’s engagement party, despite the latter’s sick free association skills. While Ron certainly never wants to socialize with the man, he’s mostly disappointed that Tom would share his idea with someone so lacking in work ethic and, let’s face it, smarts. In giving Jean Ralphio the ax, Tom becomes a “serious person” in Ron’s eyes. He can make decisions that aren’t entirely based on instant gratification. Or, in his words, “Sometimes, you gotta work a little, so you can ball a lot.” Ron in 60 Seconds doesn’t even need to see a presentation. Tom has his start-up money. And with that, little Tommy Timberlake is all groweds up. And acting like a grown up has very little to do with age. There’s no better evidence of this theory than the episode’s namesakes: Ben’s parents. Ben and Leslie are reveling in their new engagement and planning a party to celebrate. A party to which they’ll invite their families. Ben can see the thunder cloud on the horizon, threatening to rain cynicism and awkwardness all over their parade. He tries to warn Leslie that his parents have not been able to treat each other civilly since their divorce 30 years ago. “If there’s anyone who can bring my parents together,” he says to her, tenderly, “it’s no one.” Leslie, eternal optimist, has never met a lost cause she couldn’t fix. Her plan includes a Wyatt/Knope unity quilt, with each square signifying a member of their growing family. What could possibly go wrong? Ben’s parents have sunk so low in their pettiness that they only regard Leslie’s project to find fault and more reasons to scream at each other. Stephen is offended that there’s no square for Ulani; Julia resorts to vandalism to remove the square Leslie throws together for her replacement. And Ulani is pregnant. And none of them will go to the wedding. Finally, Leslie accepts defeat. A woman after my own heart, she packs up all the brownies and four bottles of wine and tries to convince Ben to run away with her. But Ben’s had it with being the grown up in his family. His parents have forced him and Leslie to spend their entire engagement party trying to keep them from strangling one another. He’s not going to let them ruin their wedding too. He and Leslie rejoin the party to take a stand, but not after a rejuvenating backseat makeout sesh. Beslie inform Julia, Ulani, and Stephen that they will all go to the wedding, they won’t make a scene, and they will tell the happy couple that they had a great time. The chastisement is more effective than any appeasement strategy. Ben can’t fix his parents, but he can tell them that he expects them to act like adults. More importantly, Leslie doesn’t hold Ben’s insane family against him. She rightly believes that his parents’ toxic relationship hasn’t a thing to do with her future happiness. Unless Ben goes crazy in his old age. But she’s got her eyes peeled for that. They’re so perfect. First of all, Sage and I were both incredibly lucky considering Hurricane Sandy. Neither one of us lost power, even though Sage lost the internet for a brief time. I feel sort of guilty that my biggest crisis was the fact that we got down to 1.5 bottles of wine by the end! And like any good pop culture/TV Junkies, we passed the time by marathoning TV shows…Sage went with The West Wing and Being Human (The UK version naturally), while I went with some Classic Doctor Who (my first experience with Tom Baker! I can see why people loved him so) and old school Grey’s Anatomy. Not a bad way to pass the time. Things are sloooooooowly getting back to normal here. Subways are still out, so my office remains blissfully closed until further notice. Yay! 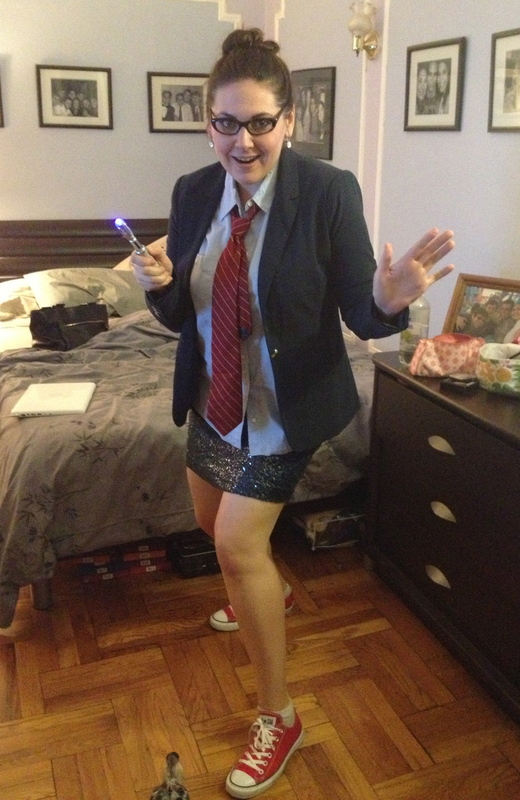 While we didn’t QUITE take Barney Stinson’s advice about slutting up for Halloween, Sage and I planned months ago to go as sassy versions of the Tenth and Eleventh Doctors. Luckily, Sandy waited to strike AFTER our big Halloween plans! 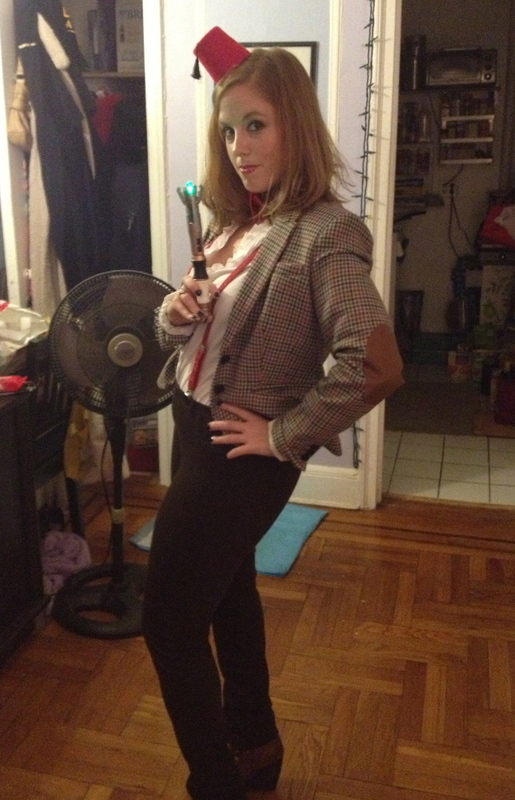 We knew we wanted to go as SOMEONE from Doctor Who and we ultimately decided to go as Doctors, as we felt that there would be more pressure for accuracy had we gone as Rose or Donna Noble or Amy Pond. I am pretty proud of our results!! We were also quite impressed with the pop culture cleverness of our friends at the party and of our friends on Twitter. Peruse more Halloween Geekery after the jump!